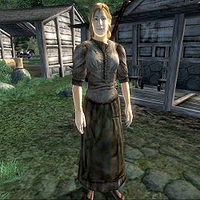 Astante is an Altmer farmer living at Brindle Home, a quaint establishment west of the Imperial City. During the related quest, Astante will point you in the direction of Melus Petilius' house should you need help in finding it. Like her fellow townsfolk Merildor and Torbal the Sufficient, she has a very simple schedule. She will simply spend all day wandering Brindle Home without eating or sleeping, even though her house contains a bed. She wears a lower class attire consisting of a coarse linen shirt, coarse linens, and a pair of oiled linen shoes. She also has a small chance (25% each) of possessing a leveled pair of heavy armor greaves, gauntlets, boots, or shield. In combat, she relies on two leveled blunt weapons. She also has a 50% chance of carrying a leveled amount of gold.